With only a handful of these “Turbo Look” Intermeccanica Roadsters ever built, this particular IM is a very unique opportunity. Two owner, very low mileage and original it will not take much to turn this beauty into a show winner. Custom built in 1987 for a PA customer this IM is still in PA and has been garage stored for its entire life. Under 18,000 total miles on the original VDO black face instruments to complement the Guards Red paint and black full leather interior featuring Recaro seats. Fitted with very custom and cool purpose made alloy wheels this full tube chassis Intermeccanica has to be one of the more unique looking Roadsters in existence. Custom bumpers and full front air dam round out the look of this custom 356! Powered by a 2110cc T-1 air cooled engine and 4 speed transaxle this IM has the potential to be as much fun to drive as it is to look at. This Intermeccanica is ready to take you on your summer’s travel adventure! These custom Roadsters consistently turns heads for that second look and is sure to find a new home quickly so do not hesitate. 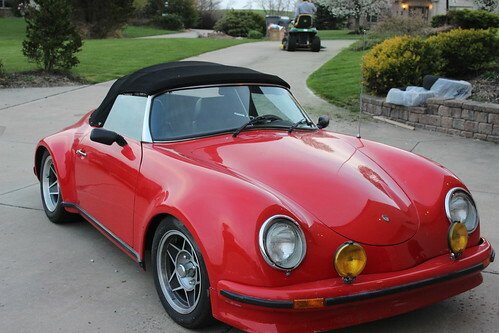 This Intermeccanica meets the requirements for import into Canada and Europe as a classic car!